Fact Sheet: Building Ecology – microBEnet: the microbiology of the Built Environment network. Buildings are more than inanimate physical entities, masses of inert material that remain relatively stable over time. The building, what’s in it (occupants and contents), and what’s around it (the larger environment) constitute a dynamic triad in which all elements affect each other. In fact, a building is a dynamic combination of physical, chemical, and biological dimensions. Buildings can be described and understood as complex systems. Some new approaches based on the frameworks, tools and methods used by ecologists to understand ecosystems can help us understand the processes continually occurring indoors and how those processes affect the durability and function of the building. Buildings change as a result of the environment around them as well as the occupants, materials, and activities within them. The surfaces and the air inside a building influence each other through constant association. For example, a window changes slightly over time as it becomes dirty, then is cleaned, accumulates dirt again, is cleaned again, and so on through its life. The “dirt” we see evolves as a result of the interactions among the moisture, chemicals, and biological materials found there. 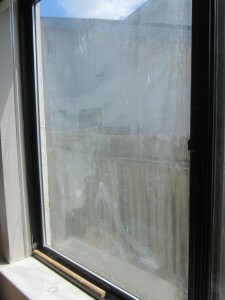 While the window glass may remain largely unchanged by the processes on its surface, other surfaces are not as stable. Flooring materials or floor coverings become worn over time, and this wear depends on their material composition and the use that is made of them, as well as the maintenance they are given. Wear results in release of chemicals and particles into the air, some of which end up on other surfaces, such as the window. Most building processes occur rather slowly — from hours to days or even years –, but some are rapid, especially those associated with human activities or ventilation with air from outdoors. Chemical interactions can quickly produce new chemicals. Among these are oxidation by ozone entering from outdoor air and reacting with commonly-found indoor air and surface organic compounds to form fine and ultrafine particles, and volatile and semi-volatile organic chemicals, and acidic aerosols, many of which are more toxic than the chemicals from which they are formed. Moisture on many surfaces supports the life, reproduction and evolution of microorganisms. The microorganisms themselves produce chemicals, some of which can alter the pH of the surface and subsequent surface chemistry. Many additional microbes arrive on human skin, which sheds on a regular basis. Inside buildings, the skin cells and the oils and other chemicals in and on them, as well the bacteria hitching a ride on them, end up on the floor, furniture, and even the walls and windows. When bacteria settle on stable surfaces, they can often form complex communities. The structure and composition of these communities depends not only on the organisms present, but also on the conditions surrounding them: the moisture, chemicals, and other particles present on the surface or in the air nearby. Some of these communities may even evolve into “biofilms” which are very stable communities that are resistant to many antimicrobial compounds and can shelter pathogenic microbes. Buildings are designed, or intended, to respond actively or passively to some of the changes wrought by wear, moisture, chemistry, and human and microbial activity with heating, cooling, ventilating, air cleaning or illuminating systems. We clean, sanitize, and maintain surfaces to enhance their appearance, performance, or longevity. In other cases, such changes subtly or even dramatically alter buildings in ways that may be important to their own integrity or their impact on building occupants. Such changes in the physical, chemical, and biological processes temporarily “define” a building at any time. To better understand buildings as complex, evolving systems we may find it useful to combine the tools of the physical sciences with those of the biological sciences. It may be especially useful to adapt some of the approaches used by scientists studying ecosystems, in order to gain an enhanced understanding of the environments in which we spend the majority of our time, our buildings. For building scientists it highlights the complex and bidirectional relationship between the physical/chemical parameters of a building and the microbiology of that environment. Attempting to control a single parameter (e.g. 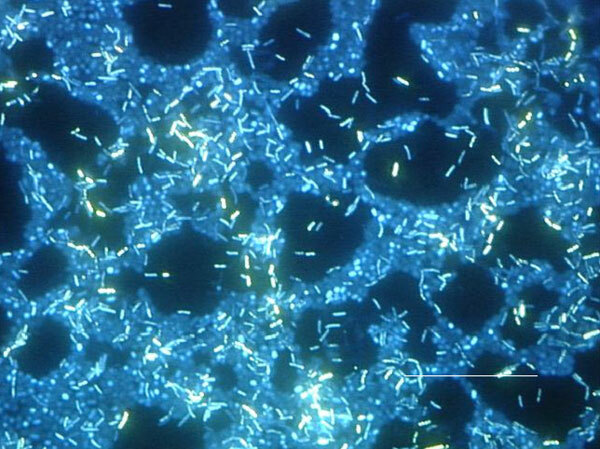 temperature) in order to regulate the growth of a single microbe (e.g. mold), for example, does not address the complexity of the system. For microbiologists it underscores the importance of understanding all of the environmental variables that are present in a given habitat. Simply collecting microbes from surfaces or materials within a structure is not enough to understand the organisms’ behavior and relationships in the context of the building. Collection of appropriate information about the building (“metadata”) such as air turnover rates and material composition is essential to understanding the microbial communities that live inside it. Window picture by David Coil (no copyright restrictions), biofilm picture from Wikipedia Commons.